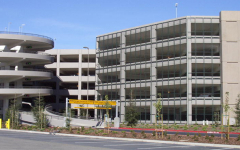 As the largest parking structure in Northern California, Sacramento International Airport Terminal A Parking Structure’s size is comparable to nine Nimitz-class aircraft carriers. 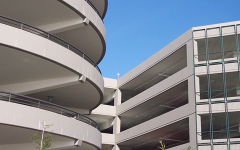 The parking structure has one inbound and one outbound exterior single-helical ramp located at the rear of the structure, and one straight express ramp located on the west side of the structure. 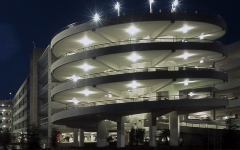 The interior of the garage is illuminated by three light wells running the width of the structure and by high-pressure sodium lamps. The interior courts defined by the light wells feature sail-like banners and spirited stands of bamboo. Four vertical pedestrian circulation towers with a total of 11 elevators reduces conflicts between pedestrians and vehicles, promoting safety within the building. 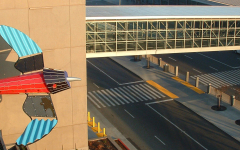 A pedestrian bridge safely provides a path for travelers high above the busy arrival and departure pick-up/drop-off zones. The garage control system includes a vehicle counting system with dynamic signage that operates on a real-time basis for optimum floor usage. Closed-circuit television cameras are placed at strategic locations throughout the garage and are connected to the Airport’s Communication Center for enhanced security.